It is an opaque gem and has the composition of Beryllium Aluminum Oxide. Mainly it is found in brown or brownish green colour with mobile streak of light that runs length wise and looks like similar to cat’s eye. It is believed that Ketu has got karmic influences upon individuals. It has been observed that during the major period or sub-period of Ketu individuals would get results as per their Karma, present or past. Like Rahu, Ketu has been given the status of a planet in Vedic Astrology though it does not have any physical existence. In astrology, gem stones are recommended on the basis of placement of planets in a horoscope. This planet is particularly known for power of intuition and occult science. Such individuals get moksha and get freedom from the cycle of birth and death. Ketu is said to be similar to Mars and gives sudden and severe results. Cat’s Eye (Lahsunia) governs this planet. Ketu is said to be exalted in Scorpio. Rahu and Ketu cause the major doshas like Kal Sarp Dosha and Pitur Dosh etc in the chart due to their placement in the chart. Cat's Eye gemstone gives fast and sudden results and suit to those individuals who are engaged in speculation and gambling etc. Ketu, the South Node or the Dragon's Head, is known as the descending node of Moon, because it marks the point where the Moon crosses the ecliptic from northern to southern celestial latitudes. Ketu is also considered ruler of sudden results, bad dreams, ghosts and evil sprites. Ketu with its enemies planets like Sun, Moon and Jupiter gives most malefic results. Negative Ketu also causes lack of concentration and sudden accidents or injuries, fire, court and law problems. Malefic aspects on Ketu give more severe results. The dasha of Ketu runs for a period of seven years where the native is tested, rewarded or punished as per one's Karma. In family relations, this signifies maternal grandfather. This planet also governs the religious bend of a person. Powerful Ketu blesses the person with intuition and occult science. Cat’s Eye should be worn if Ketu is giving weak or malefic results in the chart. 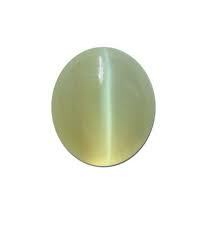 Cat’s Eye (Lahsunia) ensures relief from the malefic effect from Ketu. It clears the confusion in mind and gives stability in life and enhances positive energy of Ketu. If Ketu is weak by placement in the chart or is in debilitated state or is in enemy sign, the desired results of Ketu as well as the house it denotes cannot be expected. The person suffers from sudden events, instability, depression and failures. Ketu ring is useful to those who want to get success in gambling, horse race, astrology, law practice etc. It is equally useful for those who are involved in hypnotism and meditation. Black Magic, fear complex, fear from ghosts or bad dreams cannot affect one who wears this ring. One is safe from accidents and injuries. Gems affect the subtle energy field of human being. (To understand subtle energy, see our article Theory of Subtle Energy). Our energy and thought process and accordingly the actions (karmas) are governed by this subtle energy. If malefic planets are posited with Ketu, or Ketu is placed in 8th or 12th house of a chart, Cat's Eye should be worn. But finally before wearing this gem, the horoscope should be got analyzed by learned Astrologer. When Lahsunia is worn in a ring or in the form of pendent, the continuously vibrating power of positive Ketu is absorbed in the individual’s aura. Thus, the aura becomes more powerful to protect the individual from any obstacle caused through any external negative energy. The wearer gains concentration and feels energetic. It helps to prevent unexpected and sudden mishaps and saves from accidents and secret enemies. Negative, malefic or weak Ketu denotes many diseases like obsessions, insanity, mental disorder, urine problems paralyses and stomach problems. By wearing Cat’s Eye gemstone, a man can overcome these problems along with mental disorders and obsessive disorders, if any. Cat's Eye gem is worn to enable one to exhaust the wheel of karmic desires. By achieving this state soul start heading towards higher spiritual worlds. Cat’s Eye may be embedded in Silver and ring should be worn on Tuesday morning (Shukla Paksha) after dipping the ring in Gangajal or un-boiled milk and energizing the Gem with the prescribed mantras. Cat’s Eye is considered a hot gem by nature.